From a distance, this e-bike could easily be mistaken for its non-assist forebear. For some, this is a problem; for others, it’s a gift. Like the non-assist Aria, the Aria e-road strikes a definite aero pose with shapely tubes, sharp lines, internal cable routing and seat binder, and the now-ubiquitous dropped seatstays. However, it is a unique mold to make room for the Panasonic battery that’s hidden in the downtube. Besides the rear hub, the only giveaway that the bike has power assist is the plug-in module on the downtube and the on/off button on the top tube. 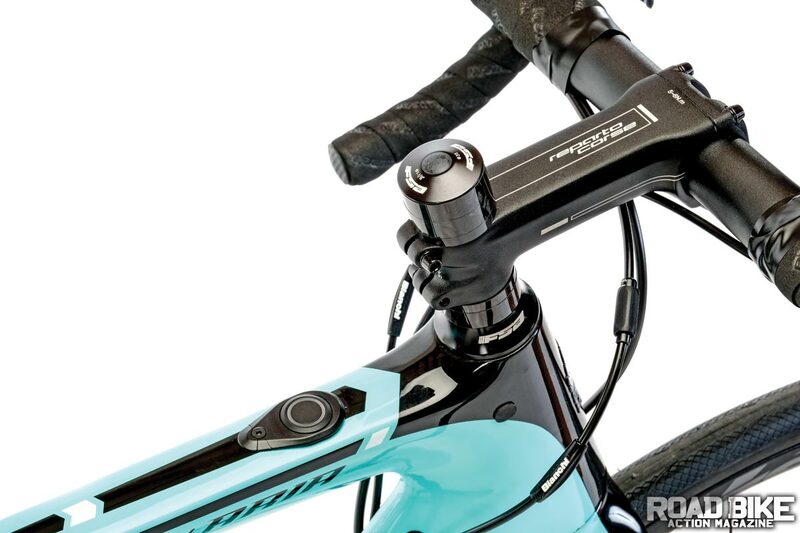 A simple button located on the top tube handles on/off and power-mode operations. Spec’d with 28mm tires, there’s not much room to go larger, especially with the lack of over-the-top clearance on the front tire. 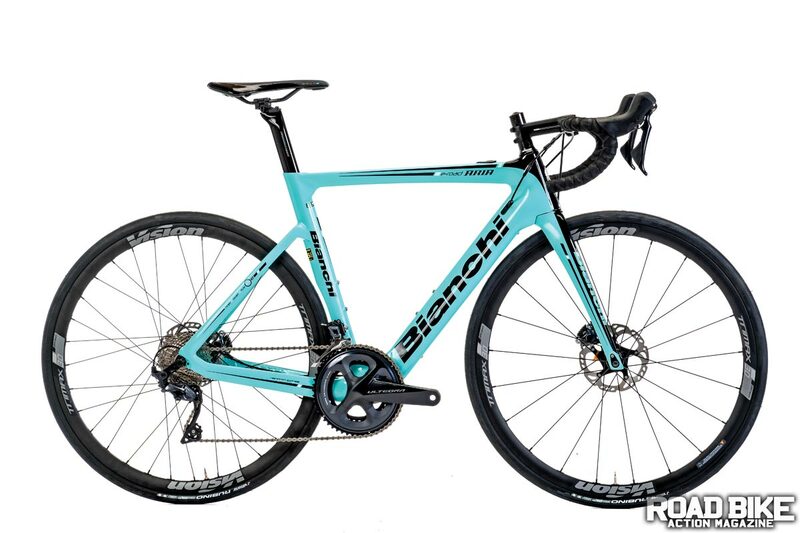 Seven frame sizes are available and, happily, Bianchi chose to slather the frame in a thick coat of their legacy Celeste green paint. 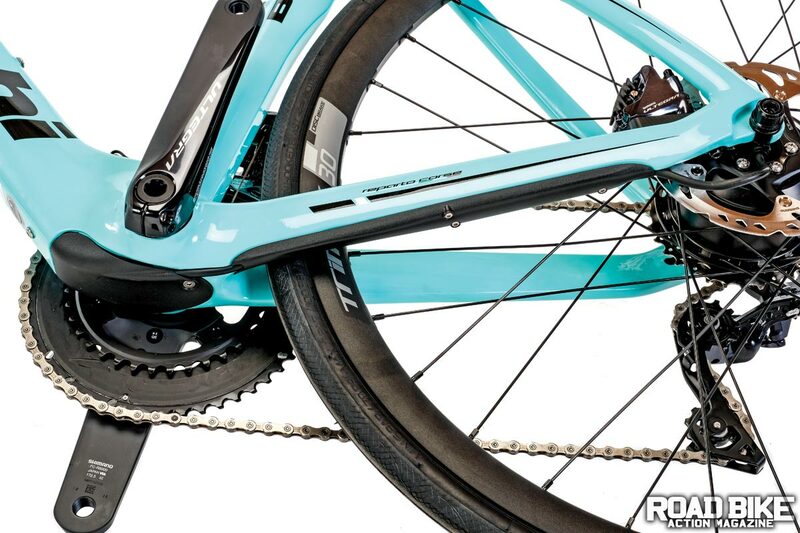 What Bianchi calls their Inner Power Drive system is actually an off-the-shelf assembly made by Ebikemotion in Spain. This powerplant will soon find spec in a handful of e-bikes from other brands. Unlike a majority of e-mountain bikes that rely on mid-mount motors, the Ebikemotion system is based on a 36-volt/250-watt rear hub motor that produces 40 N/m of torque. Important to note is that the motor only provides assist up to 20 mph, at which point it cuts off and it all comes down to human assist. The wiring that connects the motor to the battery runs under the chainstay. Along with an 8mm Allen for the axle, the cover needs to be removed in order to fix a flat. While there are pluses to using a rear-hub system for mountain bikes, conventional wisdom has it that mid-mount motors make more sense. For a road bike application, the Ebikemotion design makes sense, and that’s mostly because the internal battery can be removed and a rear wheel (that weighs 8.2 pounds) swapped for a non-motorized version to leave you with a perfectly capable, non-assist road bike that weighs about 10 pounds less. Talk about dual-purpose! The on/off button on the top tube is also where you adjust the motor’s three power assist modes, each identified by its own color code: eco/green offers 30 percent of assist, comfort/orange offers 60 percent and power/red provides 100 percent of assist. Bianchi claims that the Aria needs less than four hours to be recharged. An accessory battery that fits in the bottle cage will extend the bike’s range. Bianchi claims that the system can be recharged in less than four hours. As it is with every pedal-assist bike, the range depends entirely on a variety of factors, including rider weight, amount of headwind and climbing, and which power mode is used most and for how long. Furthering their insidious plot of deception, Ebikemotion makes an external battery that looks like a water bottle to provide additional range. As with most things electronic today, Bianchi also has a special app that can provide the Aria e-road owner with multiple data functions, including GPS tracking, motor function and battery status. Owing to the added cost of the power system, the Aria had to save build costs elsewhere to keep it priced within reason, so there is nothing too fancy here as you might expect to find on a bike that costs over six grand. 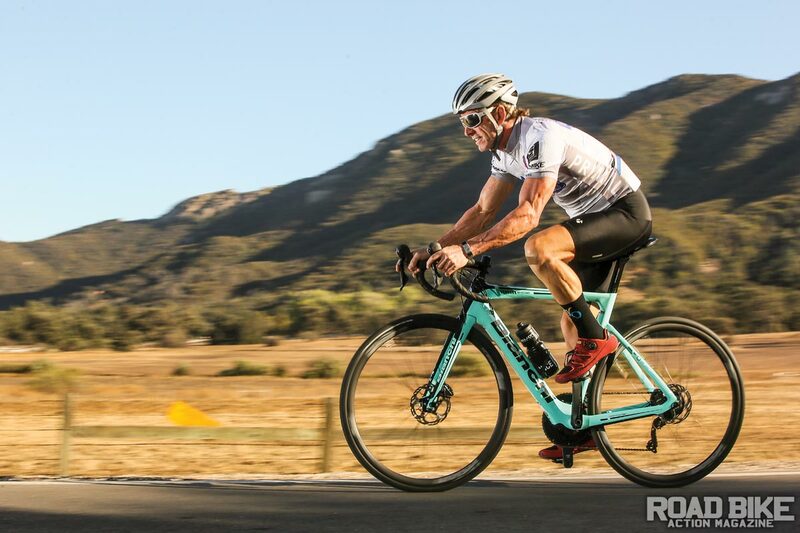 Luckily, the bike is spec’d with a Shimano Ultegra drivetrain and hydraulic disc brakes, which are the standard bearers for performance and dependability. The aluminum Vision TriMax wheels are mounted with 28mm Vittoria Rubino tires. 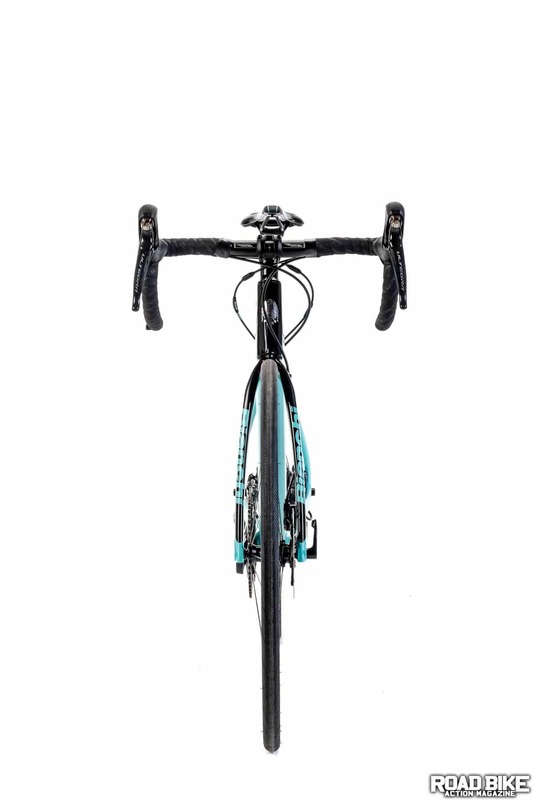 Despite their “Reparto Corse” branding, the aluminum handlebar and stem have as much in common with Bianchi’s venerated “race shop” as glazed donuts have with keto diets. The 250-watt motor resides in the rear hub. Unlike an e-bike with a motorized crank, the Aria’s wheel can easily be swapped out for a non-motorized wheel. One of the most frequently heard questions regarding the Aria was who the potential customer would be. Owing to its 20-mph-max assist, the Aria is out of place for cyclists who regularly ride with fast groups. We took the bike out for the weekly Rose Bowl training ride, and while we were able to hold our own with the pack on the 32-mph-plus descent, when we looped around to the west-side climb, we were quickly gapped as they continued at a 26-mph-plus speed, but we were unable to keep pace with the nearly 27-pound bike. 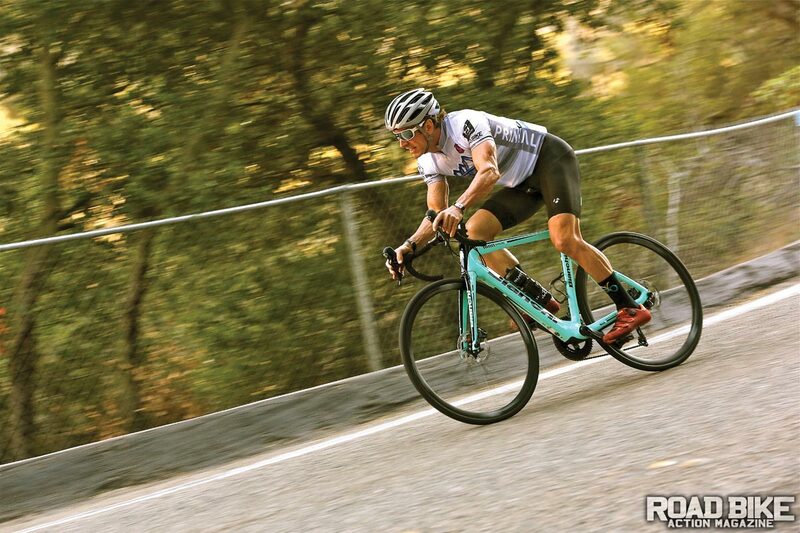 Even the folks at Bianchi were cognizant of the bike’s limitations and rightfully pointed out that the bike isn’t intended for the more serious, performance-oriented riders among us. Despite the three power modes, we felt the power was most efficient and effective between 9–16 mph. When pedaling above that speed, no matter what mode we were in, there was much less of a noticeable impact of assist. At all points through the power curve, the motor delivers a smooth, surge-free assist. One other warning, which we mentioned after our first ride with the Ebikemotion motor (RBA, October 2018): it’s best to avoid accessing different power modes while riding, because it forces you to take your eyes off the road while pushing the power mode button, and that can be as dangerous as texting while driving. Talk about a bike that elicited plenty of comments and opinions! Due to its traditional look, wherever we rode the Bianchi, no one could believe that it was an e-bike. For some, that was an asset. For the angry mob, it was nothing short of duplicitous skulduggery. The bottom line: e-bikes are here, and they have a place and will thrive with an appreciative public who enjoy cycling but want/need just a little bit of assistance. Is that so horrible? Unlike non-assist bicycles, e-bikes face a litany of laws and regulations pertaining to their power and max speed. 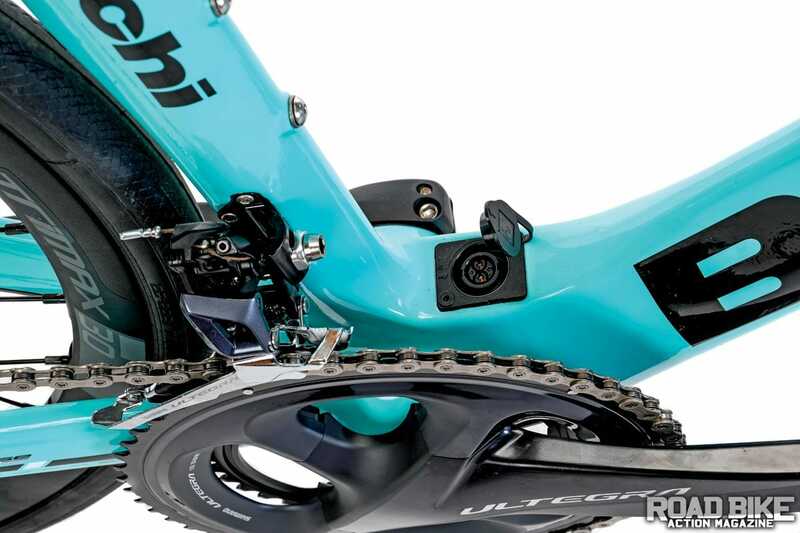 The Bianchi falls under the Class 1 category, which mandates a power assist cut-off at 20 mph and is the most widely allowed. To truly elicit a popular response from more serious roadies, e-road bikes would be better spec’d for a Class 3 designation that allows a motor to assist up to 28 mph. With the Aria e-Road, Bianchi nailed it in terms of appearance. As for performance, the bike could be the perfect antidote to the road enthusiast who wouldn’t mind a little extra assistance over the top of a long climb. It’s not illegal, it’s not cheating and it’s not immoral; it’s cycling. • Don’t be a hater!